Prizren is a small town so wherever you stay it’s likely you’ll be within walking distance of the points of interest. The official name for the fortress is Kalaja but it’s also known as Prizren Castle. 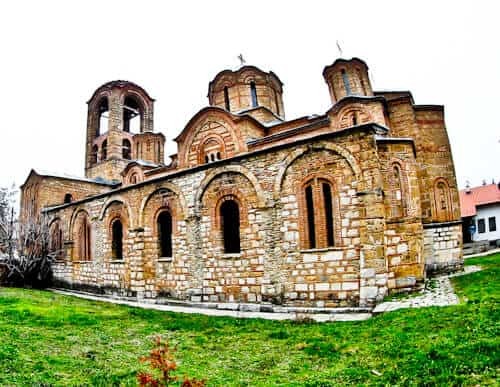 It was built in the 11th century and utilized throughout the Byzantine, Serbian as well as Ottoman empires. Nowadays however, it’s a tourist site. It’s a short uphill walk from the center of Prizren to the fortress. Perhaps more impressive than the fortress itself are the views over the city. Those who love posing for Instagram photos can make use of the high walls and incredible backdrops, be careful! For regular photographers, you can take a postcard perfect shot of the mosque, river and old bridge, especially around sunset. 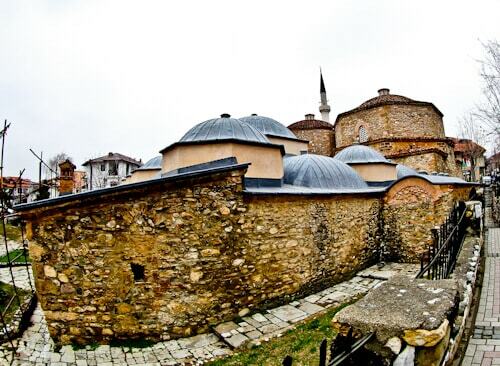 As you walk up to Prizren Fortress it’s worth stopping for a few moments to explore the Church of the Holy Saviour. With all the history in Kosovo, it’s interesting that it wasn’t until 2004 that this church received significant damage. It was severely damaged by vandals during civil unrest. The Sinan Pasha Mosque is a 400 year old Ottoman era mosque. 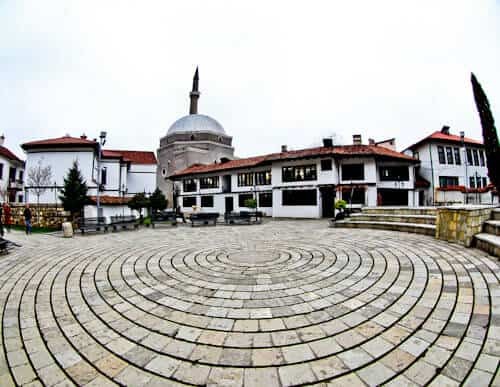 It’s the most famous mosque of Prizren therefore it’s one of the top things to do in Prizren Kosovo. If you visit, it’s likely that the locals will invite you inside. For men, you should wear trousers, women need to cover up well and both of course must take off your shoes. The interior is stunning and you’re welcome to take pictures. The most famous old bridge (stari most) in the world is located in Mostar, Bosnia. However, Prizren has its own old bridge which is much more peaceful than the Mostar equivalent. Something this bridge has in common with Mostar is that it was completely destroyed. Unlike Mostar bridge which was bombed, this bridge was destroyed by natural causes. In 1979 heavy rains brought flooding, as a result the original bridge was washed away. 3 years later a new ‘Old Stone Bridge’ was completed which remains today. The Old Stone Bridge is a popular location for Instagram photography in Prizren. 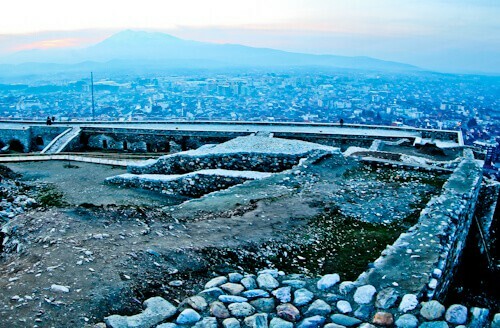 There is one UNESCO site in Prizren. 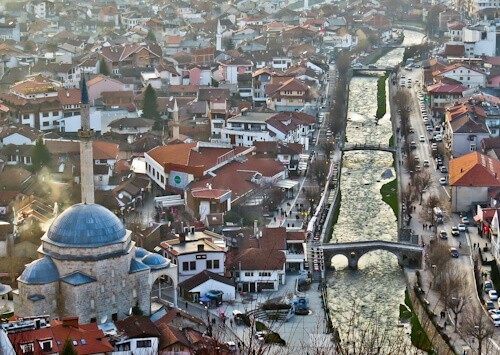 It’s located within walking distance of the other things to do in Prizren. 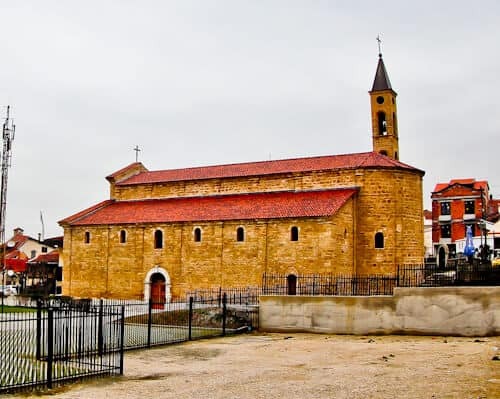 Our Lady of Ljevis Orthodox Church is a Serbian Orthodox church which dates back to the 14th century. As you can imagine with the recent history in Kosovo, this church has been significantly damaged. As a result it’s on danger list of UNESCO sites. 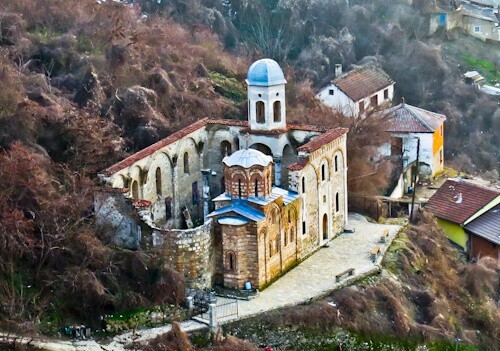 Any further unrest in Kosovo could see this historic church destroyed. Sharr Mountains National Park is the place to go to escape the city. It offers wonderful views over glacial lakes. Additionally, if you visit in the winter it’s possible to go snowshoeing in this region. I met an excellent value guide during my stay, if you would like to know more please drop a comment. In this museum you’ll learn all about the Albanian League of Prizren and their purpose. They would actually hold their meetings on these premises. For this reason you’ll see lots of historical items from this group. It’s interesting to find out that the Albanians not only struggle with the Serbians but also with the Ottomans. 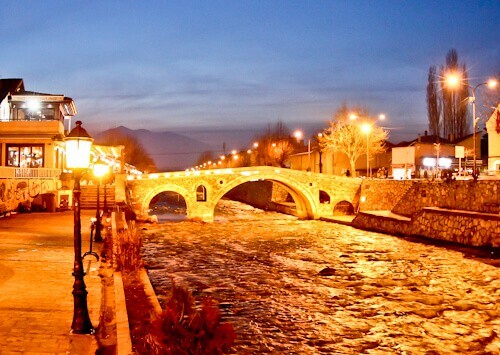 A must in Prizren is to take a walk alongside the river Bistrica. Marash Park is on the banks of the river and is home to an interesting tree. 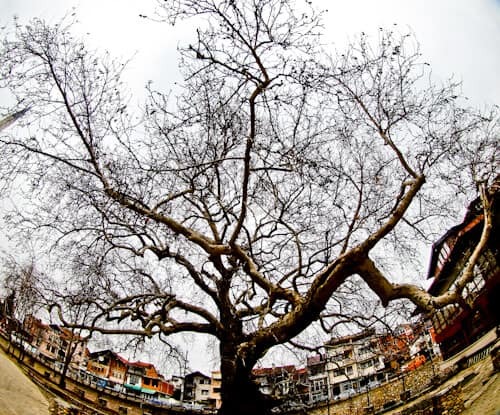 It’s believed the tree is over 400 years old which makes it older than the Sinan Pasha Mosque. You cannot miss the tree, it’s huge! It’s worth walking to the Prizren Cathedral as you’ll pass many shops and coffee shops along the way. The cathedral dates back to the 19th century but looks brand new. In addition, if you go inside there are some interesting frescoes to view. Interestingly, the clock tower was designed by a Croatian monk. As I mentioned about Mostar Sniper Tower in Bosnia, street art is often more interesting in countries affected by war. If you explore the city, you’ll come across lots of street art. 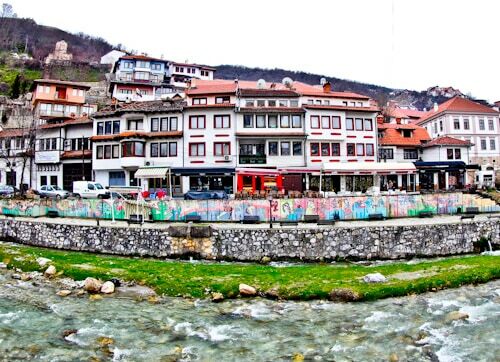 The majority of the street art in Prizren Kosovo however is along the banks of the river Bistrica. Those who love to make Instagram poses with street art as a background will be in their element here. There is a Turkish Hammam in Prizren Kosovo, unfortunately it’s no longer in use. It was used as a hammam up to 1944, afterwards cheese was produced here. Later it was used as a warehouse, more recently it’s used to host cultural events. Today, you can view it and it is one of the stand out monuments of the city. Finally, if you wish to see another mosque and bridge, I recommend the Suzi Celebi Mosque. It’s a few hundred meters down the river from the Sinan Pasha Mosque. 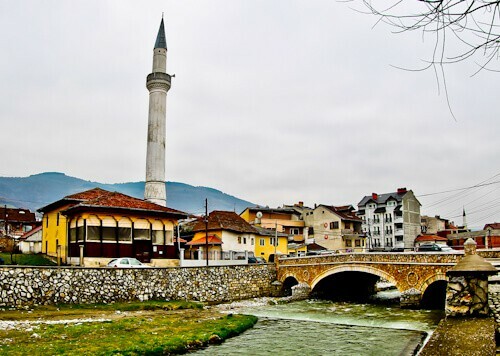 This mosque is the oldest in Prizren at 500 years old. It was built in honor of the famous Ottoman poet, Suzi Celebi. As a matter of fact, he is buried inside. 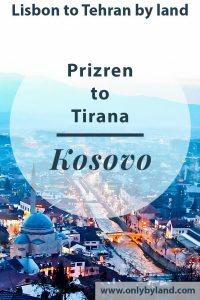 I recommend buying your ticket from Prizren to Tirana, Albania a day in advance. Opposite the bus station is the ticket office where you buy the ticket. The bus leaves early morning therefore the ticket office will not be open. Additionally, the bus leaves from outside the bus station. 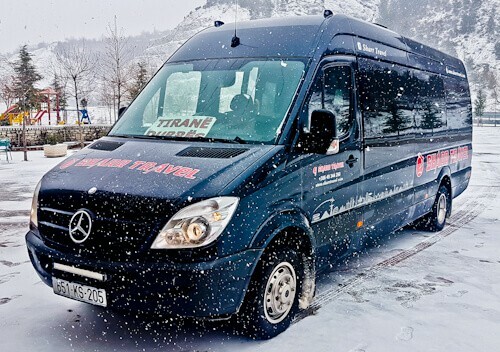 It takes 3 hours to travel from Prizren to Tirana, Albania. The border is not busy so it should be a quick border crossing. Furthermore, the bus continues on to Durres therefore if you’re traveling from Prizren to Durres then you can also take this service.